According to the National Association of Home Builders, the front porch is coming back. So what are some decor options for this small but social spot? No matter how much space you’ve got to work with, try to coordinate front-porch decor with your interiors for a cohesive look indoors and out. Those who live near water might like the crisp coastal vibe of all-weather wicker seating in creamy white with blue cushions, tied in with starfish, stripe or lattice patterned outdoor rug, and navy ceramic planters. And for boho decor fans, there are patterned terracotta planters, folk-arty floral rugs, fruity-hued and fringed toss pillows, and woven furniture. Want a swinging seat, but don’t have a beam to hang it from? Consider Casaza’s freestanding swing chair, with a sturdy powder-coated frame holding an all-weather rattan seat with a plush cushion. Also here, a selection of ceramic or cement stools with unusual painted or textured finishes. If you have no electrical outlet handy, you can still illuminate your front-porch seating area with battery-powered or solar lighting. 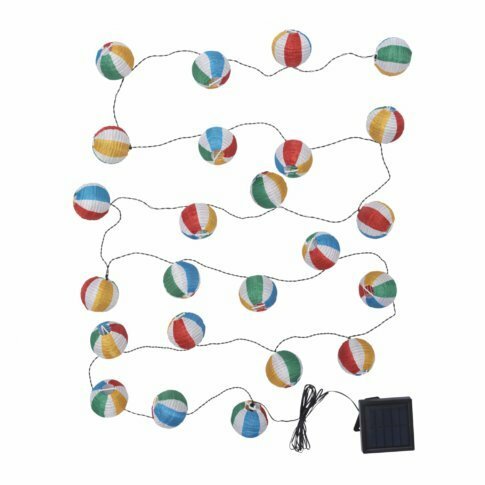 IKEA ‘s new Solvinden solar collection includes string lights as well as table and floor lights, with beachy stripe or polka-dot patterns. You’ll find whitewashed wood ones at HomeGoods, and Wayfair has a broad range of metal, ceramic or wood options. Use battery-operated pillar candles that can be tapped on and off with a remote control, for safety and convenience. Terrain ‘s Wildfire pillar offers a realistic flickering flame, and can be handily recharged with a USB cord.